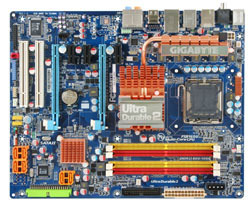 ・Supports Intel® Core 2™ multi-core and 45nm processors. ・1600 MHz FSB (Front Side Bus) support. ・High quality CPU power module with Ferrite Core Chokes, Lower RDS (on) MOSFETs and Lower ESR Solid Capacitors. ・Supports ATI CrossFireX™ with Dual PCI-E 2.0 x16 graphics for extreme gaming performance. ・ALC889A with DTS Connect enables high quality Full Rate Lossless Audio and support for both Blu-ray and HD DVD. ・Features SATA 3Gb/s with Quad eSATA 2 interface. ・Quad BIOS for an extended level of protection. ・Quad-Triple Phase Power Design for ultimate system stability. ・2 Gigabit Ethernet LAN through Teaming.